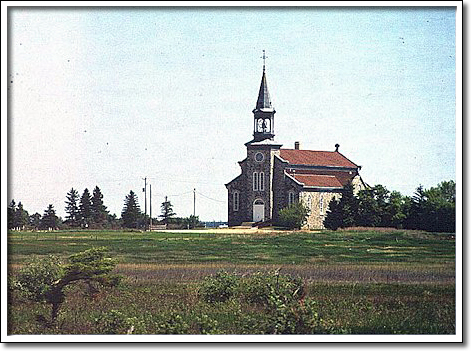 During the late 19th century, missionaries of the Roman Catholic and Anglican Churches provided a stabilizing influence as the western frontiers of Canada were opened. Along the west shores of Lake Winnipegosis, it was the Catholic Oblates of Mary Immaculate who undertook mission work with Aboriginal and Métis groups. The Oblates provided education at a large dormitory school. In 1910 the congregation began construction of a church, completing their work in 1912. Our Lady of Seven Sorrows likely was designed by one of the Oblate Fathers, Reverend St. Germain, with construction undertaken by the congregation. No other Roman Catholic mission church was as large. Indeed, few Roman Catholic churches in the south were as ambitious. In 1930 fire destroyed the interior, but the congregation determinedly rebuilt. Like other Latin churches in Manitoba, the Camperville church has its architectural roots in Quebec. With their imposing size, stone construction and carefully designed facades, these buildings were impressive monuments to the faith.